Before you read this please read: The Mountain Stream from the first two months of this blog. The Labyrinth I walked in Evergreen CO. I remember driving up to Evergreen Colorado that day with a sense of anticipation. The depression I’d woken up with on the third day of my week of Silence had slowly faded and now as we sat on the mountainside, shoes off, walking barefoot through the cool grass I couldn’t believe I was about to walk a Labyrinth. I’d wanted to do this for since I’d finished Christian George’s book but didn’t know where to go to find one. So when Millie announced that we’d be spending part of the 4th of July walking one I was thrilled. 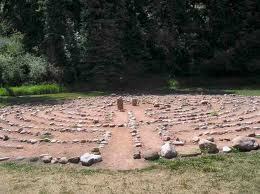 If you read The Mountain Stream then you read all about Labyrinth walking as a prayer ritual. As you are entering the Labyrinth you are entering into God, leaving all the things of the world behind you and just allowing your mind to focus on the God of the universe. When you reach the center you have reached the heart of God, the very center of the almighty creator, what I’m finding to be a very vast yet comforting place. Then as you are leaving you are re-entering the world, this is a perfect time for Vow Making or even reflective prayer, looking back on what you’ve experienced while in the Labyrinth. It’s important to note that Labyrinth Walking is extremely experienced based. George writes specifically of Protestants; “we practice this discipline not as a means of earning salvation but as a way to experience the God of salvation through new and earthly means” (138). But in that experience we get catch a glimpse of God’s mystery, or hear Him speak to us in a way we’ve never experienced Him before. George also informs us that walking a Labyrinth is the perfect time to purge everything from your system, as I did on that mountainside last summer. Getting all the things we keep bottled up inside and never confess will help us clear our heads for later times in the day, and process things we might have been feeling earlier in the day, like the depression that marked my morning. Labyrinth Walking is a good Discipline to practice alone, but it is also a good one to practice in a group setting as well. One of the conditions we had on that mountainside was that we couldn’t talk for two hours, but we needed to pay attention to what God was doing when we were in the Labyrinth, that our hearts needed to be prepared and our spirits quieted like the Psalmist in 131 before we could go in. It was interesting walking that Labyrinth with other people, because occasionally God would stop me and tell me to look up and show me where I was in relationship to others. Then He’d say “There are times when you feel close to people and times you feel far away from people, but I am always here with you, I have and I will be.” In the center there were about three of us and God used that to show me that I was part of a body, and through the hug of one of my brothers in the center God showed me I was loved by the body. If you’ve ever wanted to see God use people to make a point in your life, walk a Labyrinth with a group and a spirit that’s ready and eager to listen, you may be surprised. It’s important to note that our experiences may be extremely different. As we sat around listening to one another that afternoon there was a common thread to the conversation, and that was that God spoke, but it wasn’t the same for everyone. I needed to go back through my past (as I outlined in the article I posted at the top of this article). So God could show me that He was there through every painful moment and that He was there in that moment and every present moment coming. It was extremely important for me to know that He would continue to be there long after I left Denver. That He already had my future planned out for me and was going to be there in every future situation. Labyrinth Walking is a strange discipline that’s for sure, it’s not something we are used to. Like prayer, fasting, obedience and so on. It’s a physical activity that allows us to experience God on a level that we’ve never really experienced Him before. It can also combines prayer, silence and even fasting together and then allows us to move into a place of meditation, it can be done in solitude and through it we can practice God’s presence. All the Discipline’s working together to benefit us as a body of Believers, transforming us into a healthy and strong body. So go and find a Labyrinth and take about two hours to be silence and then catch a glimpse of the Mystery of God as He speaks to you as you move through the circles of the path. Remember as you walk that there are times when you will feel far from God and times when you will feel near to Him. Then once you are done, reflect on that time, what the Lord said to you and where you need to go from there. – Authors Note – If you have ever read George’s book or are reading it you’ll notice that Meditation and Solitude come before Labyrinth Walking. I’ve re-ordered these three because Solitude, Meditation and Practicing God’s Presence fit together so well, and can all be done in a Labyrinth so I felt the need for a different order, hope you don’t mind.